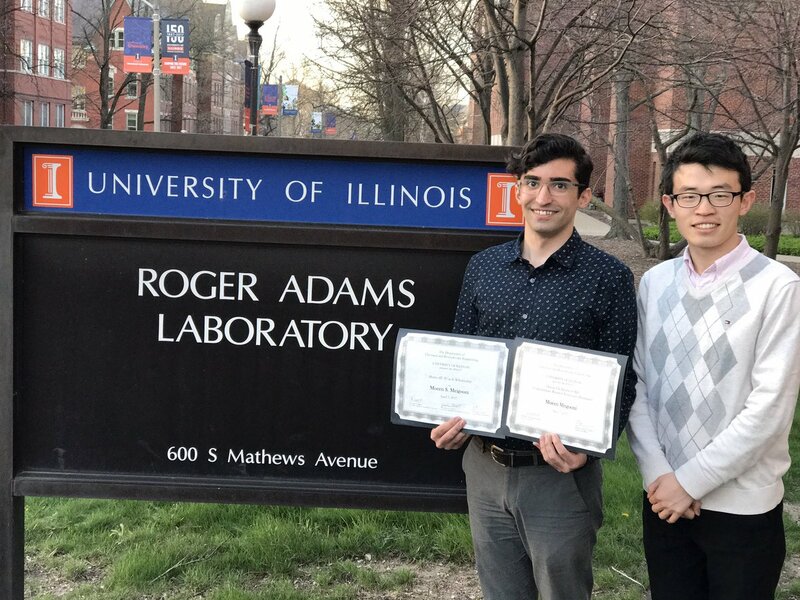 January 2019: Jiangyan Feng received the Hanratty Travel Award from the Department of Chemical & Biomolecular Engineering at Illinois. Congratulations Jiangyan! November 2018: Chuankai Zhao gave a seminar on understanding molecular mechanisms of drought resistance in plants in the Photosynthesis Research Unit seminar on campus. Congratulations Chuankai! April 2018: Jiangyan Feng was selected for the Chia Chen Chu fellowship from the School of Chemical Sciences. Congratulations Jiangyan! April 2018: Faisal Aldukhi is among the 19 undergraduate students from across the U.S. selected for the Blue Waters Internship program. Read the news here. April 2018: Qihua Chen (MatSE’18) received many graduate school admission offers. She will join MatSE program at Northwestern University in Fall. Congratulations Qihua! March 2018: Check out our invited review paper in Molecular Simulation on “Recruiting machine learning methods for molecular simulations of proteins“. Congratulations Shriyaa! February 2018: Zahra Shamsi and Alexander Moffett present their research work at Biophysical Society meeting in San Francisco. January 2018: Check out our recent invited review paper on “Using molecular simulation to explore the nanoscale dynamics of the plant kinome” in Biochemical Journal. Congratulations Alexander ! December 2017: Our group’s new innovator award was covered in Illinois news, ChBE, and FFAR press releases. December 2017: Prof. Shukla met with members of the congressional committee on Agriculture including our Illinois representative Rodney Davis (IL-13) to discuss the research on improving nitrogen use efficiency of plants being pursued in Shukla group. December 2017: Check out our recent paper with Huber group (Plant Biology) on “Allosteric Control of a Plant Receptor Kinase through S-Glutathionylation” in Biophysical Journal. Congratulations Alex and Kyle! October 2017: Jiming Chen and Matthew Chan, first year graduate students in Chemical & Biomolecular engineering join our group. Welcome Jiming and Matt! September 2017: Zahra is awarded the Hanratty travel grant to present her work at AIChE annual meeting in Minneapolis. Congratulations Zahra! August 2017: Zahra Shamsi wins the Graduate Teaching Award from the School of Chemical Sciences for teaching ChBE440 Process Control & Dynamics. Congrtulations Zahra! Read the full news here. July 2017: Check out our paper on Optimal probes algorithm for design of probes for DEER spectroscopy in the Journal of physical chemistry. Congratulations Shriyaa! July 2017: Our group has an open position for a postdoctoral fellow starting Fall 2017. See more details on our openings page! June 2017: Check out our recent paper on activation of plant kinases in Journal of biological chemistry! May 2017: Check out the recent perspective on Crops in silico project published in the Frontiers in Plant Science. April 2017: Moeen wins the second prize in the Annual ChBE Undergraduate Research Symposium. Congratulations Moeen! January 2017: Graduate student Zahra Shamsi and Prof. Shukla feature in the list of excellent TAs and Teachers respectively for teaching ChBE 440 Process Control and Dynamics. December 2016: Group picture time in our lab! October 2016: Graduate Student Jiangyan Feng joins our group. Welcome, Jiangyan! September 2016: Graduate Student Chuankai Zhao passes the Oral Qualifying Exam. Congratulations, Chuankai! May 2016: Balaji Selvam presented a poster on his work at the Plants in silico symposium at NCSA and Prof. Shukla gave an invited talk at the symposium on molecular modeling of nitrate metabolism in plants. May 2016: Graduate Student Shriyaa Mittal received the CSE fellowship from the Computational Science and Engineering Program at Illinois. Congratulations Shriyaa! April 2016: Book chapter on the “Hidden Markov Models and their applications” accepted for publication in Methods in Molecular Biology. Congratulations to all the authors! 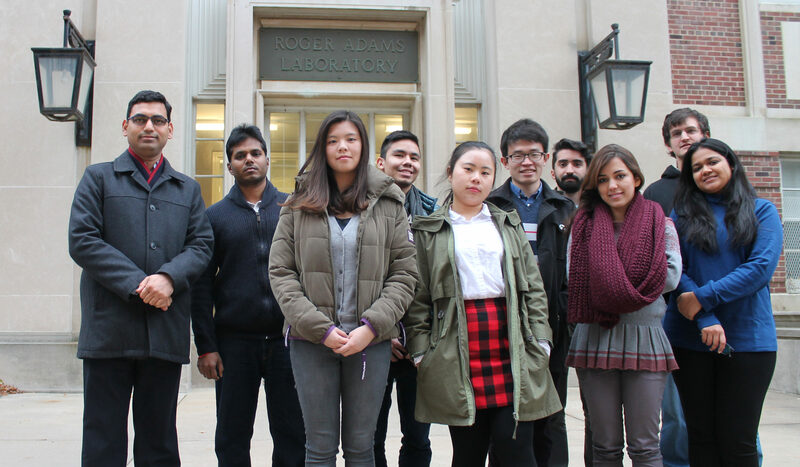 March 2016: Graduate students Zahra Shamsi and Saurabh Shukla gave research talks at the AIChE Midwest meeting. January 2016: Graduate students Zahra Shamsi and Chuankai Zhao pass the oral qualifying exam. Congratulations! December 2015: Biophysics & Quantitative Biology Graduate Student, Shriyaa Mittal joins our group. Shriyaa holds a Bachelor’s degree in Computer Science and Master’s degree in Computational Natural Science from IIIT Hyderabad, India. October 2015: Prof. Shukla gave a seminar on our group’s research as part of the CSE (Computational Science and Engineering) Seminar Series at NCSA. September 2015: Dr. Shukla gave a talk on “Some thoughts on the future of Molecular Dynamics” as part of the Midwest Computational Bimolecular Modeling Symposium organized by Prof. Klaus Schulten’s group at Beckman Institute. 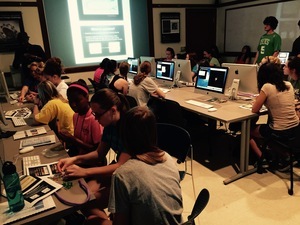 July 2015: Shukla Group participates in the outreach activities as part of Girls’ Adventures in Mathematics, Engineering and Science (GAMES) camp at Illinois. To learn more about the GAMES camp, please visit this page. May 2015: Diwakar recently gave research talks in Prof. Klaus Schulten’s group (Theoretical & Computational Biophysics group at Illinois; May 4) and in Blue Waters Symposium (May 12) at Sunriver Resort, Oregon. April 2015: Qingyuan (ChBE, MCB ’17) is selected as one of the Blue Waters Intern for the year 2015-16. Congratulations! March 2015: Diwakar wins the Engineering Council Outstanding Advising Award. Congratulations! Feb 2015: Paper titled “Conserve Water: A Method for the Analysis of Solvent in Molecular Dynamics” by Harrigan et al. accepted for publication in Journal of Chemical Theory and Computation. Jan 2015: ChBE Graduate student Zahra Shamsi joins our group. Welcome Zahra! Dec 2014: Paper on “Markov State Models Provide Insights into Dynamic Modulation of Protein Function” by Shukla et al. accepted for publication in Accounts of Chemical Research. Dec 2014: Paper on “Elucidating Ligand-Modulated Conformational Landscape of GPCRs Using Cloud-computing Approaches” by Shukla et al. accepted for publication in Methods in Enzymology. Dec 2014: Paper on “Cloud computing approaches for predicting ligand-binding poses and pathways” by Lawrenz et al. accepted for publication in Nature Scientific Reports. Oct 2014: Diwakar gave an invited talk at the GPCR Based Drug Discovery Conference, Boston on Oct 8th. The agenda of the conference can be found here. May 2014: Shukla Group website goes online. January 2019: Soumajit Dutta passed the Chemical & Biomolecular Engineering PhD qualifying exam with flying colors! Congratulations Soumajit! April 2018: Kevin Cheng received the NSF graduate fellowship to work on understanding mechanism of sugar transport in plants. Congratulations Kevin! April 2018: Qihua Chen won the best presentation award at the Chemical Engineering Undergraduate Research Symposium. Way to go! March 2018: Our recent paper on G-Protein Coupled Receptors now features on the cover of Angewandte Chemie International Edition. Check out the cover here. March 2018: Shriyaa Mittal, CSE Fellow 2017-18 presented her research work in the CSE seminar series. Check out the video here ! February 2018: Check out our recent paper in Angewandte Chemie International Edition on “Universality of the Sodium Ion Binding Mechanism in Class A G‐Protein‐Coupled Receptors“. Congratulations Balaji and Zahra! December 2017: Our group received the “New Innovator award in Food and Agriculture Research” from the Foundation for food and agriculture research! December 2017: Check out the news article about our research paper on regulation of plant kinases, “Researchers harness the power of a supercomputer to better understand plant enzymes“. November 2017: Zahra Shamsi and Prof. Shukla presented several talks and a poster at 2017 AIChE Annual Meeting at Minneapolis. Prof. Shukla also chaired the session on Data Mining and Machine Learning in Molecular Sciences. October 2017: Check out our recent paper on “Enhanced unbiased sampling of protein dynamics using evolutionary coupling information” in Scientific Reports. Congratulations Zahra and Alex! October 2017: Shriyaa presented her work on ‘Optimal Probes’ at the Gracehopper Conference in Orlando. Congratulations Shriyaa! September 2017: Check out Prof. Shukla’s interview about his role as a director for Girls Adventure in Mathematics Engineering and Sciences Camp. Congratulations to the entire GAMES team! July 2017: Dr. Balaji Selvam wins one of three best poster awards at the Monsanto Research Symposium. Congratulations Balaji! July 2017: Check our our latest paper in collaboration with Diao group on printable electronics technology published in Nature Communications. Congratulations Diao group and Chuankai!! Here is the link to the news about this article and the article on the nature website. June 2017: Our group organized the Girls Adventure in Mathematics, Engineering and Sciences Camp for high school girls from across the country. June 2017: Prof. Shukla feature in the list of excellent Teachers for teaching undergraduate and graduate elective ChBE 478/594 DS. May 2017: Moeen graduates with an undergraduate degree in ChBE. Congratulations to the second alumni of ShuklaGroup! May 2017: Shriyaa Mittal is the recipient of the CSE fellowship from the Computational Science and Engineering program at Illinois. Congratulations Shriyaa! April 2017: Kevin Cheng is the recipient of the prestigious Ford Foundation fellowship from the National Academies of Arts, Sciences and Medicine. Congratulations Kevin! March 2017: Undergraduate student Qihua Chen was selected as the Blue Waters Intern for the year 2017-18. Congratulations Qihua! February 2017: Balaji Selvam and Shriyaa Mittal gave oral presentations on their work on membrane transporters at the Annual Biophysical Society meeting. December 2016: Graduate Student Kevin Cheng joins our lab. Welcome Kevin! November 2016: Prof. Shukla gave a talk at AIChE meeting in San Francisco. July 2016: Graduate Student Alex Moffet gives a talk at Blue Waters Symposium at Sunriver resort, Oregon. June 2016: Prof. Shukla features in the list of excellent teachers selected by students for teaching ChBE523, Graduate course on Heat and Mass Transfer. May 2016: Graduate Student Zahra Shamsi selected for the Widiger Fellowship from the department of Chemical and Biomolecular Engineering. Congratulations Zahra! April 2016: Undergraduate researcher Moeen Meigooni selected for the Illinois Scholars Undergraduate Research Program. Congratulations Moeen! March 2016: Undergraduate student Zeynep Ali got admission offers from many top graduate programs in Chemical Engineering and Bioengineering. She will be joining the joint Bioengineering program of UCSF and Berkeley in Fall. Congratulations, Zeynep! March 2016: Prof. Shukla gave an invited lecture on the “Protein Conformational Networks” in the IB502 Biological Networks Course taught by Prof. Amy Marshall-Colon. March 2016: Prof. Shukla gave a talk in the Molecular Mechanics session at the ACS Annual Meeting, San Diego on “Mechanistic insights into the activation mechanism of cellular signaling proteins”. January 2016: Prof. Shukla gave a talk in the “Physiology and Molecular Plant Biology” Seminar Series in the Department of Plant Biology and Crop Sciences at UIUC. October 2015: Our group visited Booker T. Washington STEM Academy in Champaign to teach kids about protein structure and function. For more information about this exciting activity, read our blog post here. October 2015: First year ChBE graduate student Chuankai “Kyle” Zhao joins our group. Welcome Kyle! July 2015: Diwakar gave an invited talk on Brassinosteroid signaling in plants at the FASEB Science Research Conference on Protein Kinases and Protein Phosphorylation (SRC-PKPP). July 2015: iSEE funds Plants insilico project. Check out the news article here. June 2015: Check out Diwakar’s interview in the Spring 2015 issue of MassTransfer magazine. June 2015: Paper titled “A network of molecular switches controls the activation of the two-component response regulator NtrC” published in Nature Communications. June 2015: Undergraduate students Erik Saathoff and Moeen Meigooni join our group as summer interns. Welcome! May 2015: Check out our recent Folding@home blog post. March 2015: Diwakar is now a faculty member in the Center for Biophysics and Computational Biology and an affiliate faculty at the National Center for Supercomputing Applications. Feb 2015: Diwakar is selected as one of the “Blue Waters Professor” at Illinois, an honor that comes with substantial computing and data resources on the Blue Waters Supercomputer. Jan 2015: Recent article in Accounts of Chemical Research by Shukla et al. has been selected as an ACS editor’s choice article. The selection of these articles is based on recommendations by the scientific editors of ACS journals from around the world. These articles remain open for all to access and read. Jan 2015: Diwakar is now an affiliate faculty in the Computational Science & Engineering program at Illinois. Dec 2014: Biophysics graduate student Alexander Moffett joins the group. Welcome Alex ! Dec 2014: Paper on “Automatic Order Parameters Selection In Markov State Models for Atomistic Understanding of Molecular Dynamics Data” by Sultan et al. accepted for publication in Journal of Chemical Theory and Computation. Nov 2014: Diwakar chairs two sessions on “Molecular Modeling & Simulations of Complex Molecules” in AIChE meeting at Atlanta. He also gave a talk on “Elucidating Activation Mechanisms of Key Signaling Protein for Selective Drug Design”. April 2014: Diwakar will join Department of Chemical and Biomolecular Engineering, University of Illinois at Urbana-Champaign in January 2015. January 2014: Our work highlighted on Nature Chemistry Cover Jan 2014.